Do you think it's right to Torture Prisoners? This photo was taken at an exhibit on medieval torture at the Tower of London. At the time it was taken, 35.4% had approved of torture as punishment, 26.8% had conditionally approved as an interrogation method, and 37.8% were against it. 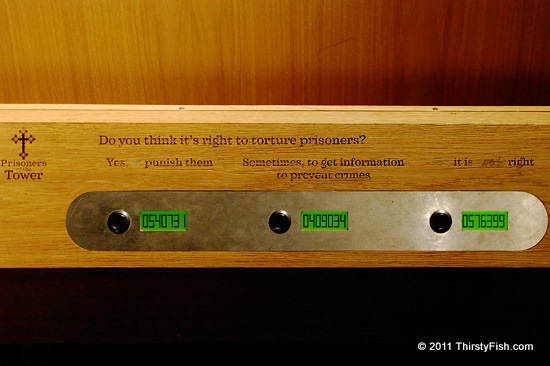 Effectively, 62.2% of those that pressed the buttons approved of torture! This number is roughly consistent with surveys done in the United States, Britain and France. Quoting the Wikipedia article, Torture: is prohibited under international law and the domestic laws of most countries in the 21st century. It is considered to be a violation of human rights, and is declared to be unacceptable by Article 5 of the UN Universal Declaration of Human Rights. Signatories of the Third Geneva Convention and Fourth Geneva Convention officially agree not to torture prisoners in armed conflicts. Torture is also prohibited by the United Nations Convention Against Torture, which has been ratified by 147 states. Despite being signatories in all those, both the US and the UK were accused of using "cruel and unusual punishments" or "outsourcing torture" in the recent years. The 2010 film "Unthinkable" starring Samuel L. Jackson, raises some interesting questions related to torture.